Kristin appeared in couple mainstream films, but the roles were really small that unless you were looking for her, you missed her. She does seem more comfortable with doing interviews for movies that are a lot more low profile then she does with the Twilight Saga, and I don't blame her. Some fandoms can be brutal if you say the wrong thing, or say something and not fully explain what you mean. 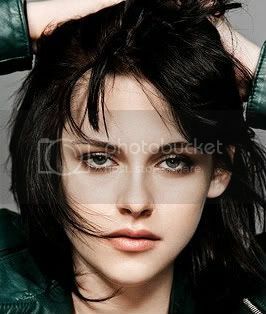 I though that Twilight was good overall, and that Kristen's acting really stood out-stangely, I imagined someone like Kristen as Bella when I was working at the library and sneaking peeks at the plot summaries in the book jackets. However, we have to remember that Twilight was made to a relatively small budget(though Audi could've run two American Le Mans Series seasons with $37 million), and with a director who nailed the emotional aspects, but didn't quite get it 100% right with the supernatural/SFX stuff, which is Weitz' area of expertise. And the blue filters didn't do it for me either-they made Kristen, Rob and every one else look like flushed zombies as far as their skin tone half the time. From what I've seen, New Moon will be better overall, as the book is more emotionally charged. And for those who say that Kristen can't act, I've seen Speak and loved it, The Messgengers and loved it, and I even loved Twilight. Granted, in Twilight, Melissa could've injected more scenes into it, but there's only so much one can shoe horn into a two hour movie derived from a 500 page book, as mentoned in the guidelines for the threads in this area-I'll bet you that the movie "Pink Floyd: The Wall" had things cut from it when it was written, and the movie was written by the same guy who wrote the lyrics from The Wall album-Pink Floyd bassist and then lead singer Roger Waters. Also, the cast know more about what they need and would like to do in general. I feel that in specific that Kristen has more to go from in New Moon-more emotionally charged, and more her style of film. I've been a fan of her's for a few years, and it's not just her acting that does it for me-she's honest and doesn't hide her flaws, though she has admitted in interviews that she was afraid of saying the wrong thing at the wrong time(hence, the akward interviews from up to earlier this year), but that goes back to not hiding her flaws. I think that she's unique, and that should be embraced. Love her or loathe her, she should be respected, as she is trying to do the right things, but the fame stuff is new to her-she didn't get into acting for fame, she did it because she likes acting. And her castmates can't be wrong-most are friends with her, after all. If Ashley Green and KStew can become friends inspite of their clashing personalities, that says something. And its really funny too. KStew is soooo awesome in this one, and (not that I have a problem with it) is totally unawkward too1 She throws a football! In a dress! I actually love her more after watching these interviews than before. I want to be besties with her haha. Just got home from the movie. Kristen was absolutley amazing!! That's all that needs to be said. Kristen was AMAZING in NEW MOON!! New Moon was AMAZING!! Has anyone seen Kristen Stewart in Life as a House? Never head of that one, and I've heard of most of her flims, and I've seen her in Panic Room, Speak, The Messengers, and Twilight so far. topfrog007 wrote: Has anyone seen Kristen Stewart in Life as a House? She is not in that movie. I have seen it and I can't remember she was in it... It was Jena Malone! JulieM wrote: TeAm_EdWaRd-I have seen Speak and KStew was amazing in it. We have talked about that movie before on here, but it never hurts to repeat it. She was only 13 or 14 when she filmed that. And to pull that much emotion off, is just incredible. Her performance had me in tears a few times during that movie. The movie has a very important message as welll. Any KStew fan should definitely see this movie.